The Eurostar connection from London has made Paris more popular than ever as a convenient weekend destination. Paris is fairly compact and easy to navigate and many tourists opt to walk or bicycle around to soak up the flavour of the city and take in the numerous iconic landmarks and parks, or stop at one of the many pavement cafés. A cruise down the Seine is also a popular option as many of the city's greatest sights are on the river, including Notre-Dame, the Louvre, the Place de la Concorde and the Eiffel Tower. Other things to see in Paris include the Basilique du Sacre-Cœur, which offers great views over Paris. The Pompidou Centre houses the Musée National d'Art Modern, while the square to the west of the building attracts a varied assortment of street performers. 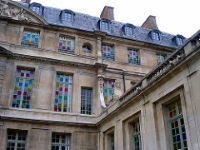 Stroll around the cobblestone streets of the Marais district with its mansions and museums, or visit the courtyards and antique shops of Ile St-Louis, which also boasts the former homes of Marie Curie, Baudelaire, and Voltaire. South of the river, the Musée d'Orsay, the Rodin Museum and the Hotel des Invalides (the burial place of many great French soldiers, including Napoleon Bonaparte) can be found. When they've finished sightseeing, visitors can idle away an afternoon in the Jardin du Luxembourg. Further along visitors can stroll through the Jardin des Plantes, Paris' first public garden, created by Louis XIII's doctor for the cultivation of medicinal plants, or visit the National History Museum. The St-Germain-des-Pres neighbourhood, the former residence of existentialists Sartre and Camus, has retained much of its bohemian atmosphere with bookshops, art galleries and coffeehouses. For free or discounted admission to many attractions in Paris, and the chance to bypass the queues, visitors can buy the Paris Museum Pass at many tourist offices, museums, or metro stations.